Now this is an interesting upgrade. Let's take a look at Reinforced Blast Doors. At the start of the Ship Phase, you may discard this card to discard up to 3 of your facedown damage cards. A few things to note. 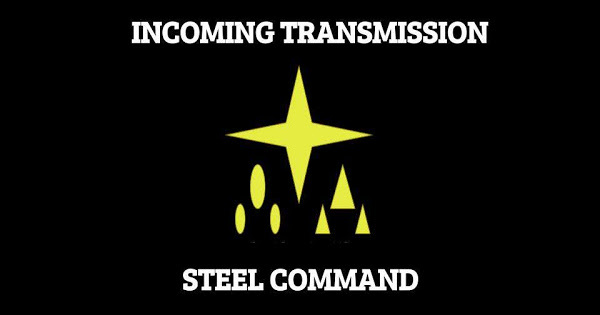 This is triggered at the start of the ship phase, as in before any ship has a chance to activate. This means that the card only works if your ship survives to the start of the next turn. Much like Rieekan as your commander, it incentives you to keep things that you know will be hurt alive until at least the start of the next turn. With that in mind, this upgrade favors ships that will survive. 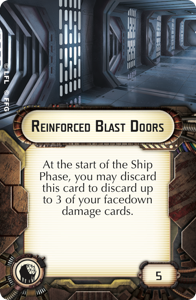 It also favors ships that will take face down damage cards, as face up damage cannot be canceled by this card. One kit that this card has found a lot of use with is the "CRambo", a CR90B with Engine Techs, designed to ram an enemy ship twice, especially with the CR90 activating last and then erasing the damage at the start of the next turn. There is some debate on how useful this upgrade is on other, larger ships. Against fighter attacks, multiple small attacks, or even ramming, the upgrade is probably more effective than Electronic Countermeasures, which is its chief competitor for the slot on an ISD or MC80H. However, a properly applied Brace can stop a lot of damage over several rounds, which makes ECM arguably better against other Large ship attacks. Boarding Troops coming out in the next wave further changes the equation, probably in favor of more Blast Doors. Note that the MC80 Assault Cruiser has the best of both worlds, since it can take two Defensive Retrofits. Will FFG get out its Nerf bat? Armada is Near Perfection. Why Are We Unhappy?